Rockwell’s expansion is boundless. Beyond Makati City, the Rockwell lifestyle can now be enjoyed in San Juan, Quezon City, Pasig, and Cebu. Consistent with its vision, it aims to deliver communities with Rockwell’s signatures of innovation, exclusivity, and unparalleled quality, wherever it makes its mark. 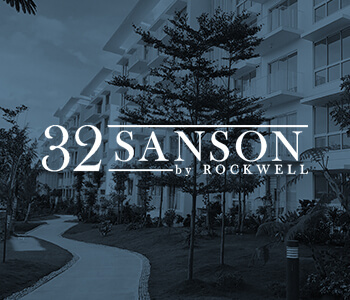 32 Sanson by Rockwell is a charming residence in Cebu, with apartments for resale and rent, characterized by space-efficient design, remarkable features, and open spaces. It is a condominium that harmonizes the charm of Lahug, Cebu City with the sophistication of the Rockwell lifestyle. 32 Sanson provides a unique experience for residents looking for a home away from home. Being in Lahug, Cebu, it is surrounded by nature while retaining the elevated quality of living that all Rockwell properties are known for. Residing in any of the spacious units allows owners or tenants access to amenities. Two swimming pools give kids and adults a place to spend the sunny days relaxing in the water. A multi-purpose court allows active residents to keep up with their sports-driven interests. The lawn and children’s area are designed so that kids may run around and explore. A clubhouse and function rooms are available for intimate gatherings or celebrating life’s milestones. Finally, a state-of-the-art gym facility helps families keep up their active lifestyle. These amenities are built for everyone in the community, for those who live alone up to large families who choose to stay in 32 Sanson. Call us at (032) 417 3888 or (0917) 817 9446 for inquiries on condominium units for resale or for rent in Lahug, Cebu. Located along C5 in Pasig, The Grove by Rockwell is within a comfortable distance from Ortigas business district, commercial centers, retail shops, top-rated schools and hospitals. It is the ideal community for young families who desire the perfect balance of work and life in the middle of a busy city. With each condominium unit designed to provide plenty of room to breathe, The Grove ensures you and your family get top-notch security and comfort in our condos for rent that only Rockwell can provide. 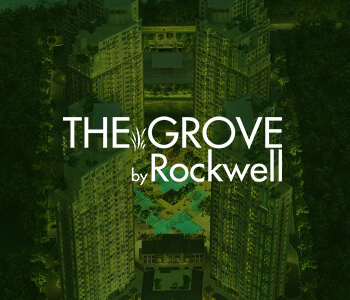 The Grove by Rockwell is an excellent address for emerging professionals, newly weds, and starting families. Built with exclusive, world-class condominium amenities, The Grove by Rockwell enables its residents to strive for a healthy overall well-being. Our living spaces are equipped with a gym facility, a dance studio, basketball and tennis courts and a podium pool ensuring you can perform physical activities you and your loved ones can enjoy. Our amenity deck and indoor lawns also allow quiet relaxation for the mind. Learn how you can find work-life balance at The Grove by calling us today at 793-1026 or (0917) 817 9446. Our Rockwell home specialists would be glad to talk to you!